George Barris with a customized 1934 Model A which he made to produce 500 horsepower. After a prolific career that included works like The Right Stuff, Bonfire of the Vanities and The Electric Kool-Aid Acid Test, New Journalism pioneer Tom Wolfe died yesterday at 88. But before New Journalism was a thing, in November 1963, Wolfe wrote a lot of words in Esquire for the first time, about George Barris and the custom-car scene in California, which Wolfe thought was elevating the practice to high art. He was right! The story, titled There Goes (Varoom! Varoom!) That Kandy Kolored (Thphhhhhh!) Tangerine-Flake Streamline Baby..., makes for somewhat hard reading these days, but the elements of Wolfe’s style—and the style of fellow New Journalism writers like Joan Didion, Norman Mailer, and Hunter S. Thompson—was already there. As they tell me about the Ford Custom Car Caravan, I can see that Ford has begun to comprehend this teen-age style of life and its potential. The way Ford appears to figure it is this: Thousands of kids are getting hold of cars and either hopping them up for speed or customizing them to some extent, usually a little of both. Before they get married they pour all their money into this. If Ford can get them hooked on Fords now, after the kids are married they’ll buy new Fords. Even the kids who aren’t full-time car nuts themselves will be influenced by which car is considered “boss.” They use that word a lot, “boss.” The kids used to consider Ford the hot car, but then, from 1955 to 1962, Chevrolet became the favorite. They had big engines and were easy to hop up, the styling was simple, and the kids could customize them easily. In 1959, and more so in 1960, Plymouth became a hot car, too. In 1961 and 1962, it was all Chevrolet and Plymouth. Now Ford is making a big push. A lot of the professional hot-rod and custom-car people, adults, will tell you that now Ford is the hot car, but you have to discount some of it, because Ford is laying money on everybody right and left, in one form or another. In the Custom Car Caravan, all the cars have been fashioned out of Ford bodies except the ones that are completely handmade, like the aforementioned Silhouette. The piece is largely about George Barris, the legendary builder and customizer who, would later redesign a revived Pontiac GTO after complaints from fans in 2004 that Pontiac, in fact, fucked it up. 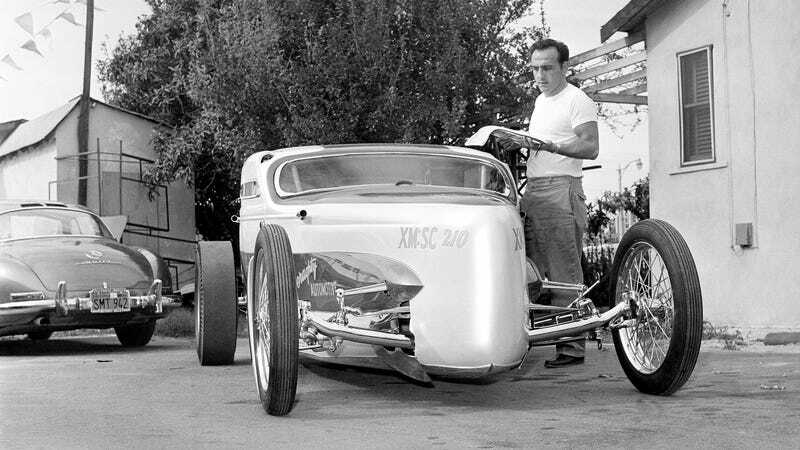 But back then Barris was just a local legend, wrenching in Southern California. Barris, whose family is Greek, is a solid little guy, five feet seven, thirty-seven years old, and he looks just like Picasso. When he’s working, which is most of the time, he wears a heavy white T-style shirt, faded off-white pants cut full with pleats in the manner of Picasso walking along a Mediterranean bluff in the wind at Rapallo, and crepe-sole slipper-style shoes, also off-white. Picasso, I should add, means nothing to Barris, although he knows who he is. It’s just that to Barris and the customizers there is no one great universe of form and design called Art. Yet that’s the universe he’s in. He’s not building cars, he’s creating forms. Barris starts taking me through Kustom City, and the place looks like any other body shop at first, but pretty soon you realize you’re in a gallery. This place is full of cars such as you have never seen before. Half of them will never touch the road. They’re put on trucks and trailers and carted all over the country to be exhibited at hot-rod and custom-car shows. They’ll run, if it comes to that—they’re full of big, powerful, hopped-up chrome-plated motors, because all that speed and power, and all that lovely apparatus, has tremendous emotional meaning to everybody in customizing. But it’s like one of these Picasso or Miro rugs. You don’t walk on the damn things. You hang them on the wall. It’s the same thing with Barris’ cars. In effect, they’re sculpture. For example, there is an incredible object he built called the XPAK-400 air car. The customizers love all that X jazz. It runs on a cushion of air, which is beside the point, because it’s a pure piece of curvilinear abstract sculpture. If Brancusi is any good, then this thing belongs on a pedestal, too. There is not a straight line in it, and only one true circle, and those countless planes, and tremendous baroque fins, and yet all in all it’s a rigid little piece of solid geometrical harmony. You can read the whole thing (paywalled) here, though perhaps more interesting that the piece itself is it was the result of writer’s block. The Thomas K. Wolfe who appears on page 114 is the same Tom Wolfe who turned up in our October issue with the article on Cassius Clay ; the change in name was established to clear up, a generation from now, any possible confusion as to which Wolfe wrote Look Homeward, Angel. Mr. Wolfe, who is an artist (see self-portrait above), though not an action-painter, wonders in this twilight of his career—he’s thirty-two—why he didn’t start free-lancing sooner. New Journalism: it was just journalism, but nobody was editing it. 1967 Voxmobile for a Psychedelic $175,000!